Imported from Florence, Italy, Marvis is a superior dental brand that has been loved in Italy for generations. 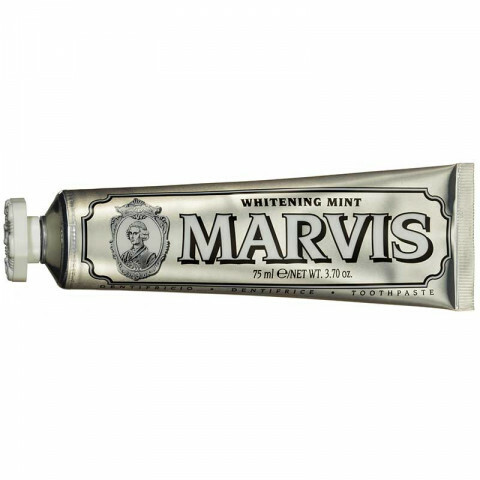 Marvis Whitening with a sharp taste of cool mint for a pleasant and lasting freshness carries out a whitening activity on your teeth for a more beautiful and splendid smile. Whitening Mint also protects teeth, keeps your breath fresh all day long and helps prevent tooth decay, tartar and plaque. I love this toothpaste!!! Makes your mouth so clean feeling and teeth so shiny!!! this toothpaste really does help whiten your teeth. pleasant taste and helps freshen breath. Since I used this product, I feel that my breath is way more fresh than using normal toothpaste. It is also a really good whitening toothpaste. So far, the toothpaste able to maintain my teeth to be white.